Hundreds of protesters have gathered in the Sudanese city of Omdurman to call for an end to the nearly 30-year rule of President Omar al-Bashir. The BBC's Mohamed Osman says security forces have used tear gas against some of the 300 or so demonstrators there. Sudan has already been rocked by two weeks of sometimes deadly street demonstrations prompted by a rise in the cost of living. The anti-government protests first erupted in mid-December over inflation. The price of bread had tripled in some places and fuel costs have also risen. 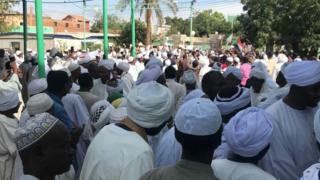 The protests in Omdurman, close to the capital Khartoum, began after Friday prayers. People were heard chanting: "Freedom, peace, and justice. Revolution is the people's choice." Many of those taking part came straight from the Al Syiad Abderhaman mosque, which is linked to the opposition Umma party. Demonstrations began on 19 December after the government announced price rises for fuel and bread. The protests have escalated into broader calls for an end to the rule of President Bashir, who came to power after a coup in 1989. Activists accuse him of mismanaging the economy. Over the past year, the cost of some goods has more than doubled, while the Sudanese pound has plunged in value. Three-quarters of Sudan's oil wealth has been lost after the country's southern half voted to secede in 2011, leading to the formation of South Sudan. Its economy has also been strained by over 20 years of US sanctions, which were lifted in October 2017. The US had introduced economic sanctions after accusing Sudan of sponsoring terrorist groups. Mr Bashir's regime has been accused of widespread human rights abuses. In 2009 and 2010, the International Criminal Court (ICC) charged him with several counts of genocide, war crimes and crimes against humanity, and a warrant was issued for his arrest.